The biggest toy brands in the U.S. might soon unite. Most kids don't care about the difference between Hasbro and Mattel — and according to new reports, the two companies might soon become one. On Friday, The Wall Street Journal reported that Hasbro made a takeover bid for its toy company rival. The two companies declined to comment to the outlet, and the likelihood of the deal's success is unclear. What is clear, however, is Mattel's financial struggle. Shares of Mattel, which makes Barbie dolls and Hot Wheels, dropped 47 percent this year, while stocks for Hasbro rose almost 18 percent. 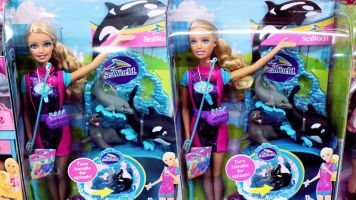 Related Story Did Mattel Really Pull SeaWorld Barbie Over Animal Rights? Many attribute Hasbro's success to its focus on creating content from its brands, which include Transformers and My Little Pony. And it maintains a strong relationship with Hollywood — Hasbro also makes toys for successful Disney franchises. Though federal regulators could block Hasbro's deal on antitrust grounds, the news of the possible merger has already impacted Mattel. By Friday afternoon, its shares had risen by around 24 percent.